When installing a new window, currently available window tapes simply don’t work, or are not made to last. EternaBond® WindowSeal is a thin polyethylene film coated with our MicroSealant. 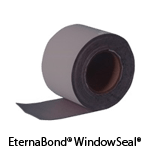 This means EternaBond® WindowSeal fuses to virtually all construction metals, wood, vinyl, OSB, metal, aluminum, brick, concrete, even glass to seal the gap between the window and the exterior sheathing. WindowSeal can be used in cold temperatures, does not shrink and fall off over time, flexes in all conditions.